VIENNA, Austria - New traces of plutonium and enriched uranium - potential material for atomic warheads - have been found in a nuclear waste facility in Iran, a revelation that came Tuesday as the Iranian president boasted his country's nuclear fuel program will soon be completed. The International Atomic Energy Agency report detailing the discovery also faulted Tehran for not cooperating with the UN watchdog's attempts to investigate other suspicious aspects of Iran's nuclear program. Iranian President Mahmoud Ahmadinejad, in a two-hour news conference in Tehran, asserted the world has no choice but to "live with a nuclear Iran," although he conceded his country was "still in the first stages" of its uranium enrichment program. So far, Tehran has been able to activate only two small experimental pilot enrichment plants that U.N. officials say have frequently broken down and have produced only small amounts of material suitable for nuclear fuel. But Iran has progressed enough since resuming enrichment activities in February to provoke a U.N. Security Council demand that it freeze its program - a call Tehran has ignored. It says it intends to move toward large-scale uranium enrichment involving 3,000 centrifuges by late 2006, then expand the program to 54,000 centrifuges. Iranian nuclear officials say 54,000 centrifuges would produce enough enriched uranium to fuel a 1,000-megawatt reactor, such as the one being built by Russia that is near completion at the southern city of Bushehr. Experts have estimated Iran would need only 1,500 centrifuges to produce a nuclear weapon. Tehran insists it is only seeking to generate low-enriched uranium for nuclear fuel and not the highly enriched variety needed for weapons. It also denies it is building a heavy water research reactor at Arak in order to obtain plutonium for nuclear arms, asserting it only wants to produce radioactive isotopes for medical research and treatment. Still, when finished - probably early in the next decade - Arak could produce enough plutonium for about two bombs a year. The Arak plant, along with the discovery of a secret Iranian enrichment program in 2003, Tehran's refusal to cease uranium enrichment and findings by IAEA inspectors have increased suspicions about Iran's program. The IAEA board in February referred Iran to the Security Council, suggesting it had breached the Nuclear Nonproliferation Treaty and might be trying to make nuclear weapons. The U.S. and its European allies are negotiating with Russia and China over a draft Security Council resolution that would penalize Iran for its refusal to respect an Aug. 31 deadline to halt enrichment. 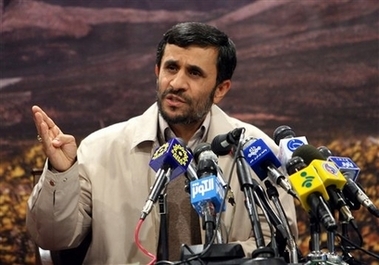 Ahmadinejad remained defiant. "I'm very hopeful that we will be able to hold the big celebration of Iran's full nuclearization in the current year," he said. Iran's calendar year ends March 20. But he acknowledged Iran still has a long way to go before it can produce enough enriched uranium for the reactor at Bushehr. "We need time to produce enough fuel for one complete nuclear power plant," he said. Tuesday's IAEA report, prepared for next week's meeting of the agency's 35-nation board, did little to dispel concerns. Beyond detailing the new plutonium and enriched uranium findings at a nuclear waste facility, it also faulted Tehran for lack of cooperation. "The agency will remain unable to make further progress in its efforts to verify the absence of undeclared nuclear material and activities in Iran" without more cooperation from Tehran, the report said. The U.S. ambassador to the United Nations, John Bolton, said Ahmadinejad's comments and the IAEA's latest discoveries "both demonstrate the urgency for the Security Council to act on Iran." "Sanctions are obviously the only means to get Iran's attention," Bolton said. As expected, the four-page IAEA report, made available to The Associated Press, confirmed that Iran continues uranium enrichment experiments in defiance of the Security Council. A senior UN official who was familiar with the report cautioned against reading too much into the findings of traces of highly enriched uranium and plutonium, saying Iran had explained both and they could plausibly be classified as byproducts of peaceful nuclear activities. The official, who spoke on condition of anonymity because he was not authorized to discuss the report publicly, said that while the uranium traces were enriched to a higher level than needed to generate power, they were below weapons-grade. The findings, however, were likely to be cited by the US and other nations suspicious of Tehran's nuclear agenda as adding to circumstantial evidence against it. Tuesday's summary also listed specific cases in which Tehran failed to cooperate with agency inspectors. They said Iran refused to let the IAEA increase monitoring of enrichment facilities at Natanz, did not respond to a request for more information on its enrichment program, denied access to suspicious equipment or military personnel, and refused to provide information on apparent experiments linking nuclear and ballistic missile research. The report will be discussed by the IAEA board next week at a meeting expected to be dominated by Iran's nuclear program, particularly its intention to ask the agency for technical help for its Arak reactor. Diplomats from nations on the IAEA board say the U.S. is lobbying against Iran's request. Seven diplomats, who demanded anonymity in exchange for discussing confidential information, told the AP they believed the board would deny Iran's request.